The Scapula is able to glide freely on the posterior chest wall due to the loose connective tissue between the serratus anterior and the chest wall. The movements of scapula are produced by the muscles that connect it to the trunk and indirectly by the muscles going from trunk to the humerus when the glenohumeral joint is fixed. All the movements of scapula occurring on the chest wall (scapulothoracic linkage) involves concomitant movements at sternoclavicular and acromioclavicular joints. In this movement, scapula moves forwards on the chest wall. It’s produced by serratus anterior assisted by the pectoralis minor muscle. Protraction is required for punching (example, boxing), pushing, and reaching forwards. In this movement, the scapulae are drawn backwards in the direction of the median plane in bracing back of the shoulders. It’s produced by middle fibres of trapezius and rhomboids. The scapula is elevated, as in shrugging, by simultaneous contraction of the levator scapulae and upper fibres of the trapezius. The scapula is depressed by simultaneous contraction of the pectoralis minor, lower fibres of trapezius, and latissimus dorsi. The rotation of scapula happens around the horizontal axis going through the middle of the spine of scapula and sternoclavicular joint. 1. Medial rotation is brought about by simultaneous contraction of levator scapulae, rhomboids, and latissimus dorsi. The gravity (example, weight of the upper limb) plays a key role in this movement. 2. Lateral rotation is brought about by the trapezius (its upper fibres raise the acromion process and its lower fibres depress the medial end of the spine of the scapula) and serratus anterior (its lower 5 digitations pull the inferior angle of the scapula forwards and laterally). The lateral rotation of the scapula tilts its glenoid cavity upwards—which is necessary for abduction of the upper limb above 90°. 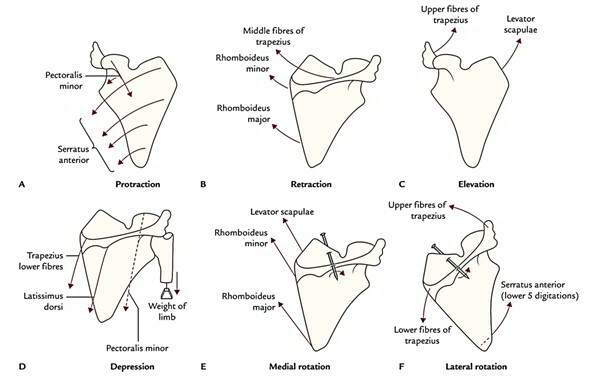 The movements of scapula and the muscles, which produce them are summarized in Table below.